This was my contribution to the Twitter Secret Santa Art Trade this year, done for Fyreuni of Daily Quests. There’s a version with text, if Fyreuni chooses to use it as a guest comic I’ll link to it, otherwise here is the non-texty version. Fyreuni, Vas, and Fyreuni's pet collection. I decided to do both Fyreuni and Vas because most times they are together in the comic and interacting (i.e. Fyreuni is griefing Vas in the best possible way). You’ll notice that bunny is totally messing up his hair. 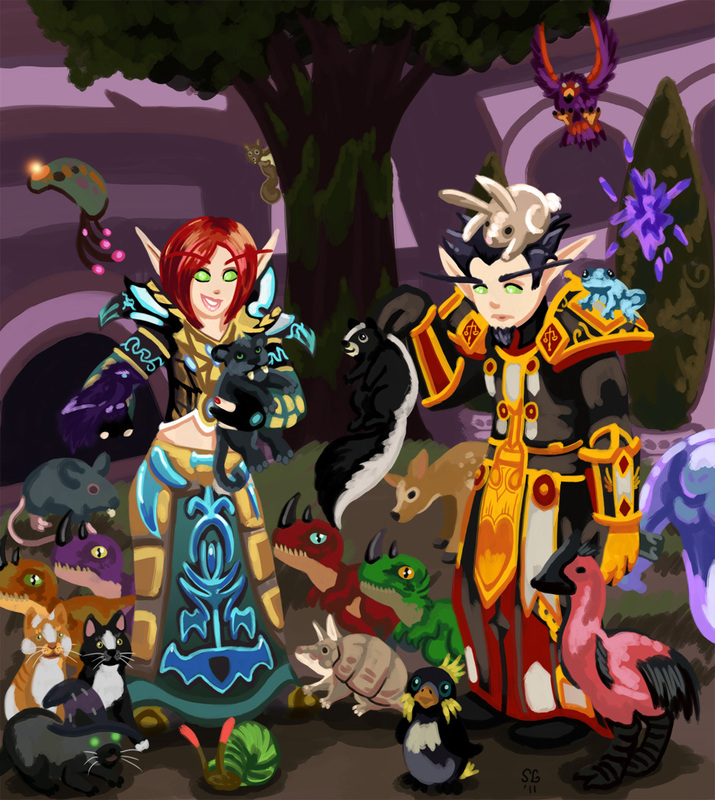 As far as the pets go, I included all pets that Fyreuni actually has, with a bias towards ones that I wanted to draw (d’aww little armadillo, boo Lil’ Taregosa). I am especially fond of the armadillo and the panther cub Fyre is holding. I did this more or less the same way that I do From Draenor With Love, which is very cartoony/chibi-esque and with no lines. It’s a time-consuming way to work but I like the results, at least for now. Anyway, I hope you all had/are having a good holiday. This is really more of a “Wednesday Art Day” post, but I’m sure that doesn’t really matter. It’s been a definite adjustment to me learning to juggle the needs of a webcomic, a blog, a guild/raiding and oh, that real life thing, too. Unfortunately it’s been Manalicious that has suffered the most because I consider the webcomic to have a hard deadline, and I’ve given priority to some RL things as well. (For example, visiting my Grandmother weekly, which I consider time really well spent). Anyway, long story short – I haven’t written here but I’m not dead and it’s just for lack of time. Today I’m working on finishing off my Secret Santa Art Trade piece, which I’m excited to share when it’s done. Look for it next Tuesday! If you check out that link on the 25th or later, all of the art should be up. It has rockets, gifts, and snow, so it’s pretty much the perfect holiday gift, in my humble and extremely biased opinion. 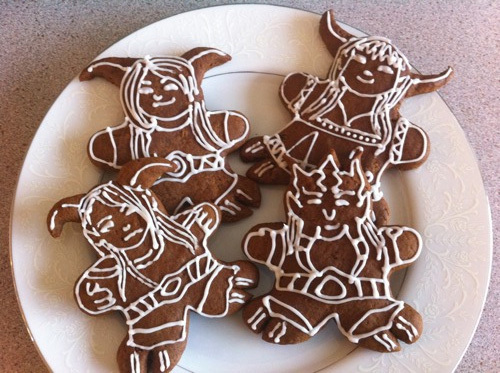 I also took part in a cookie exchange organized by Liala over at Disciplinary Action. Rather than mailing cookies, we traded and baked recipes from mystery givers, while someone else baked our own recipes. The cookies pictured above were not my cookies from this event, I made them last year but I can’t resist using the picture again. They are draenei! But also gingerbread! Mana Cake Musings wrote a nice Fire mage specific guide to Dragon Soul, if you are a mage of the fiery persuasion it’s worth checking that out. On a more serious note, Jaded Alt writes about Mental Illness and WoW in a piece that I found both insightful and personally significant. If you’ve ever struggled with depression, you’ll probably recognize yourself in what Windsoar describes. For me, WoW has been at times an unhealthy escape and a blessing. It’s good to have a way of being in contact with people, however minimally, at a time when your tolerance for socializing might be low. 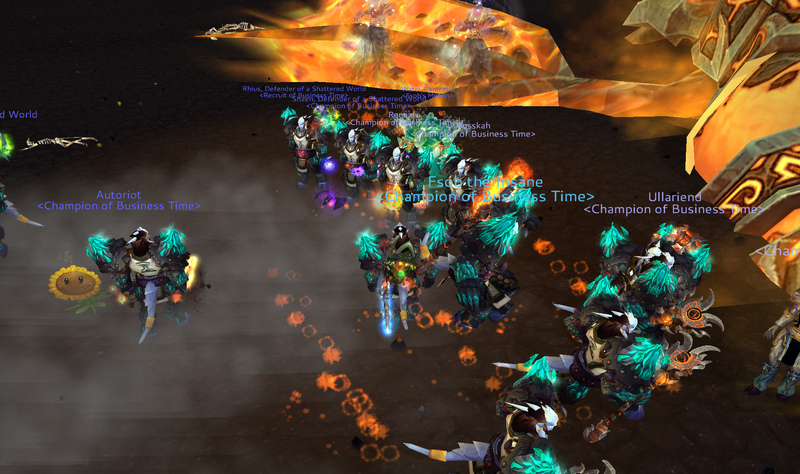 It’s also good (for me) to take myself away from WoW sometimes to get out and meet with folks face to face. I usually have to force myself to do that if I am depressed, and it usually does help. Redbeard at Parallel Context has been writing about how the blood elves and draenei are really more alike than they’d like to think. He starts part one here, but it’s a four part series so make sure you read the later three if you’re interested! 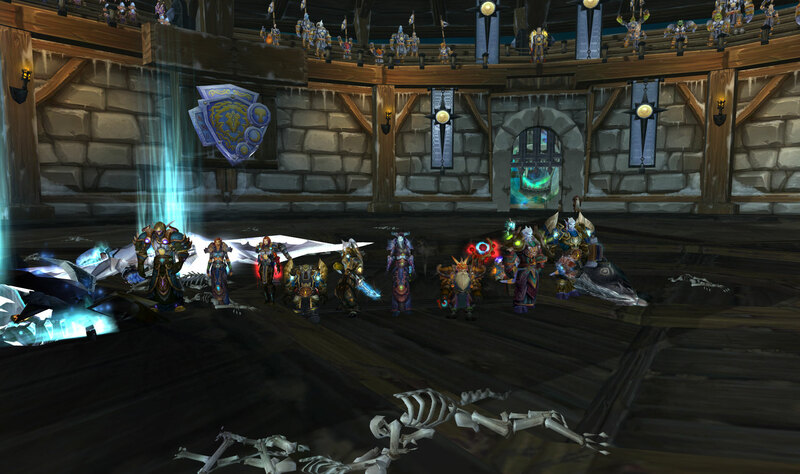 Tzufit has a post about The Ethics of Raid Finder Loot that’s very thought-provoking! You may have already seen it as it was linked from WoW Insider, but if you haven’t it is well worth a read. 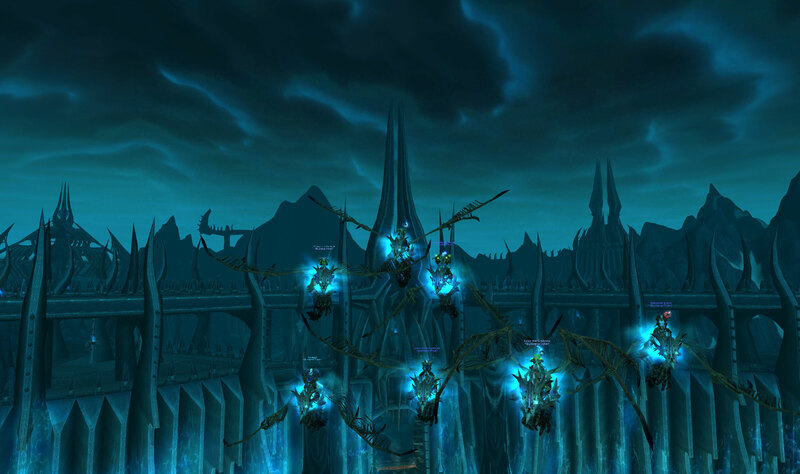 Many WoW bloggers took part in the Furtive Father Winter event and their posts are starting to be posted! I didn’t take part myself (because I was already doing the art exchange and I was already behind on doing it so I knew I wouldn’t have the time) but I’m sure there are some great gifts that came out of it. It’s always fun to discover new bloggers this way, too. 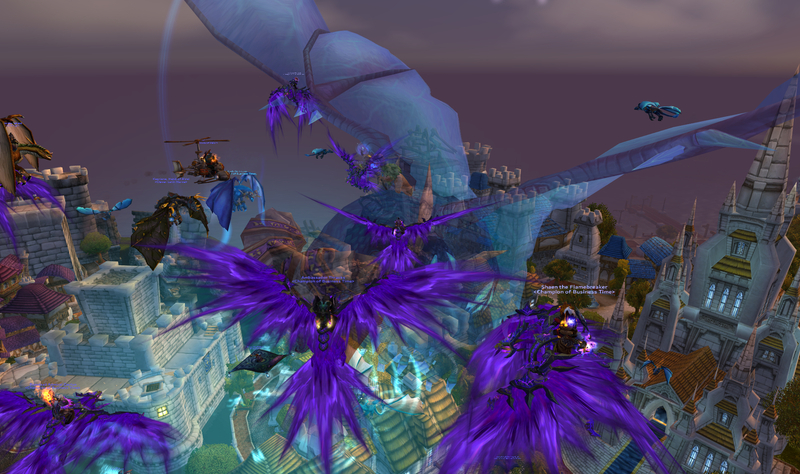 These are just a few items from around the WoW blogsphere I wanted to mention. Meaning, these are people who have been writing when I haven’t. I hope you find something you enjoy, and Merry Christmas to you if you celebrate it, happy holidays otherwise, or have a great weekend if none of the above apply to you! I’m going to be curling up with a good book and eating too much with my family. We already ate most of the baking, but it’s as if the chocolate in this house is multiplying (not that we mind).